ECOLOGO certifies products that demonstrate a reduced environmental impact. 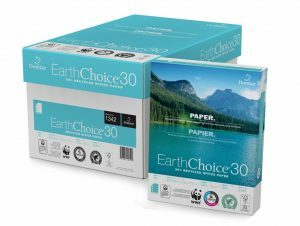 Domtar EarthChoice® Office Paper products that are manufactured in Canada include ECOLOGO certification. EU Ecolabel certification is a well-known mark in Europe that identifies products and services with a reduced environmental impact. Paper was one of the first items to carry an ecolabel, in recognition of the many benefits that trees provide. Today, demand for ecolabels as indicators of sustainability has increased significantly. According to the Ecolabel Index, there are more than 450 ecolabels in the marketplace, each highlighting an environmental or social benefit associated with a product’s sourcing or manufacture. Just as Domtar revolutionized the industry when it became the first company in North America to offer Forest Stewardship Council (FSC) certified copy paper in 2005, the company has become an early adopter of other certifications. For example, our Windsor Mill in Quebec meets standards for two well-known Type 1 ecolabels: ECOLOGO and EU Ecolabel. They require compliance with environmental and other relevant legislation. They consider the entire product lifecycle. They establish criteria that differentiate environmentally preferable products from conventional products. Here’s more information on ECOLOGO and EU Ecolabel, the Type 1 ecolabels adopted by Domtar. ECOLOGO is one of North America’s most stringent multi-attribute environmental certification marks. Founded in 1988, the program is administered by UL, a global independent safety science company. This voluntary, lifecycle-based standard certifies that products demonstrate a reduced environmental impact. Beginning in 2014, Domtar’s Windsor, Quebec Mill met the rigorous requirements for acceptable fiber sourcing and manufacturing practices, including stringent criteria on chemical use, in order to include the ECOLOGO label on products it produced. Domtar was the second paper producer to offer such certification. Today, all EarthChoice® Office Paper, EarthChoice 30 Recycled Office Paper and EarthChoice 50 Recycled Office Paper produced by the mill bears the ECOLOGO mark. 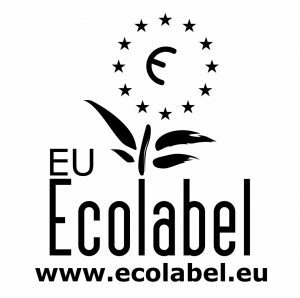 Established in 1992, the EU Ecolabel is a voluntary mark developed by scientists, NGOs and stakeholders to develop a transparent way for consumers to make environmentally responsible choices. Developed by the European Commission, EU Ecolabel certifies products with manufacturing that processes help reduce their environmental impacts across the entire lifecycle of the product, from sourcing to manufacture and use and, ultimately, to their next life. Given the standard’s origins, EU Ecolabel is primarily required by European customers, and currently appears on approximately 40,000 products and services, from baby clothes to electronics. Our Windsor Mill is one of the few manufacturers outside of Europe that boasts EU Ecolabel certification for copying and graphic paper. Today, the mill offers the popular EU Flower logo on select private brands that we export overseas. To learn more about the suite of certifications that demonstrate Domtar’s commitment to lower its environmental impact, including Type 1 ecolabels such as ECOLOGO and EU Ecolabel, please visit the Our Certifications page on our website.